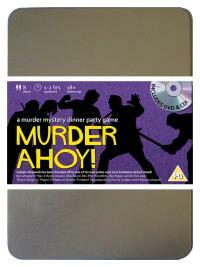 You've been invited to play the role of ORLA BOARD in Murder Ahoy. You are invited to a swashbuckling murder mystery set in the tropical waters of the Caribbean! Captain Mugwash and his pirate crew are shipwrecked on a desert island where they find a buried treasure chest. But during a drunken celebration on the beach the Captain is discovered slumped over the chest, murdered! Please join us to find out who buried the ol’ Sea Monkey! Serving Wench (she’s everyone’s port in a storm!) Costume suggestion : Your ultra-tight corset dress shows off your curvy assets to boost crew morale (amongst other things!) but it does, unfortunately, take a while to remove. Your small-heeled boots help you dig in if things get too slippery on deck and the wooden spoon you carry around is useful for stirring, and smacking naughty crew members! I’m the ship’s wench and I’ve always got a smile and wink for everyone. My job isn’t easy, what with drunken pirates always grabbing at my jugs and shivering their timbers but luckily Captain Mugwash liked to keep me for himself. Everyone knows better than to lay a finger on the Captain’s booty!